Compact dwarf evergreen shrub of dense rounded habit with pointed elliptic, matt light green leaves, bronze when young and in cold winters. Trusses of funnel-shaped, pale yellow flowers, green tinged and greenish in bud, in early to mid spring. 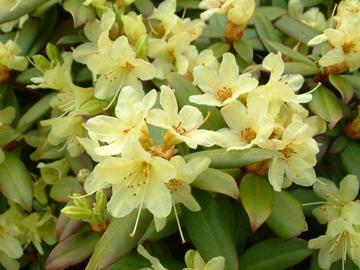 Hybrid of Rhododendron hanceanum 'Nanum' x Rhododendron keiskei.